In order to allow auto configuration of display devices some intelligence needs to be added to standard LED devices. 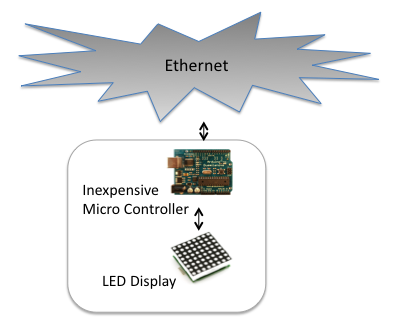 Just a small micro controller can be used to implement the support of a few network messages exchanged with the media server. Each display device must have a unique device ID. The device ID can simply be computed from a MAC address or be a serial number assigned by the manufacturer. To ensure that no collision is possible between different manufacturers a manufacturer ID is also used. The server then use the device ID and manufacturer ID to uniquely identify a display device. To allow plug and play Kling-Net can assign IP addresses to the display devices. Because of this the display devices will work with any IP address that is assigned to the media server. If a server is available on the network it will broadcast small discovery messages several time per minute and the display device must reply to them. When replying to a discovery message the display device must describe it’s geometry and the number of pixels needed. A display device can request the allocation of an IP address in the reply to a discovery message. Once the media server will receive a reply from a display device a user will be able to map it over video and start sending images to be displayed. The images that will be received by the display device will be formatted and have the size that match the format requested when the display device replied to the discovery message. Because the media server perform the image clipping and transformation and generate the right pixel format the work to be done by the display device is very minimal. ArKaos has an implementation of the work to be done on the display device. This implementation is done on an Arduino development board. The Arduino is a 16 MHZ ATmega328 processor with 2K of main memory. This represents the minimum platform that can support the Kling-Net protocol. This page was last modified on 17 December 2013, at 06:32.